Keep your eyes peeled for gems in the Pantone Color of the Year! Pantone, a wholly owned subsidiary of X-Rite, Incorporated, and provider of professional color language standards and digital solutions, today announced PANTONE 18-3838, Ultra Violet, as the Pantone Color of the Year for 2018. A dramatically provocative and thoughtful purple shade, PANTONE 18-3838 Ultra Violet communicates originality, ingenuity, and visionary thinking that points us towards the future. “We are living in a time that requires inventiveness and imagination. 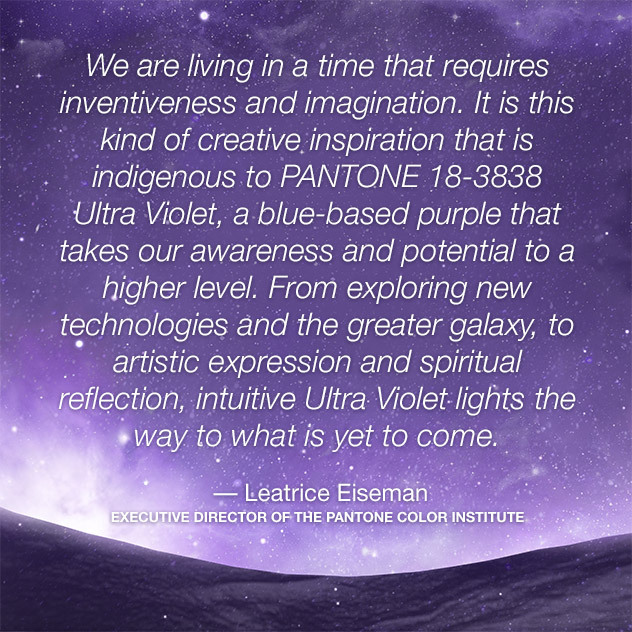 It is this kind of creative inspiration that is indigenous to PANTONE 18-3838 UltraViolet, a blue-based purple that takes our awareness and potential to a higher level,” said Leatrice Eiseman, Executive Director of the Pantone Color Institute. “From exploring new technologies and the greater galaxy to artistic expression and spiritual reflection, intuitive Ultra Violet lights the way to what is yet to come.” Complex and contemplative, Ultra Violet suggests the mysteries of the cosmos, the intrigue of what lies ahead, and the discoveries beyond where we are now. The vast and limitless night sky is symbolic of what is possible and continues to inspire the desire to pursue a world beyond our own.